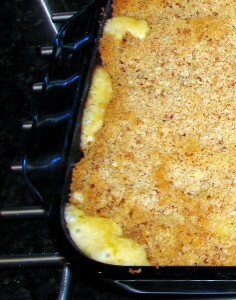 A couple of weeks ago I made some really good baked mac and cheese. I have a few recipes I’ve used in the past, and I tweaked them all and added bacon and onions to get this one, my latest experimentation. This is a meal on its own. The recipe makes a full casserole dish’s worth, so make it for a crowd or pack up a bunch of lunches from it. You can also halve everything to make a smaller amount. You don’t even have to bake it if you don’t like crust, it’s awesome right out of the saucepan. Here’s the Macaroni and Cheese How To.